The BBC Good Food Show is a fabulous day out for foodies, and I always look forward to visiting it each winter. I’m really looking forward to covering the show again this year. This year’s show runs from 29th November to 2nd December 2018, and as always, it’s a great way to kick off the festive season. You’ll be able to see some of your favourite chefs on stage at the Big Kitchen super theatre. Sessions at this year’s show will feature Mary Berry, Tom Kerridge and local favourite Glynn Purnell, plus many more. They’ll be presenting exciting recipe ideas and plenty of inspiration for your festive feast. 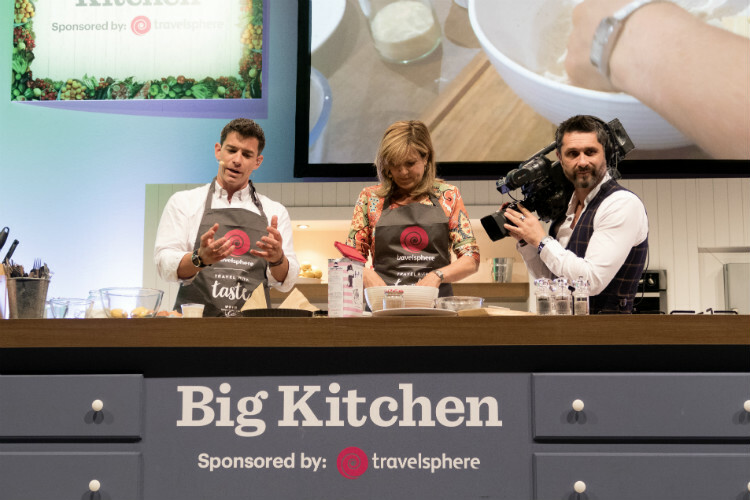 And the Big Kitchen sponsors, Travelsphere, will be presenting some additional sessions on-stage on Thursday and Friday. You can experience a taste of India with Cyrus Todiwala, Chef patron of Cafe Spice Namaste, on Thursday 29th November. While on Friday 30th November the Godfather of Spanish cooking, José Pizarro, will be presenting a taste of Spain. Meanwhile, the Winter Kitchen sponsored by Magimix is the place to go for tips, techniques and recipes for the festive season. Presenters on this stage will include Jane Devonshire, Lotte Duncan and Rosie Birkett. Or head to one of the Skills masterclasses for a hands-on skills session led by the masters. You could learn how to make sourdough, pick up some knife skills with Zwilling, or try your hand at festive cake decorating. And the Good Food Show is a fantastic opportunity to stock up on delicious food and drink ready for all the festivities ahead. With over 400 stands, you’re bound to find something you love. You can choose from big brand names as well as smaller independent and artisanal producers. If you’re looking for gift ideas, you’ll find masses of inspiration including specialist knife stalls and cookware stands. I love spotting new gin brands, and there’s always a good selection at this show. Or you could take the opportunity to pick up a book signed by one of your favourite chefs. So for information on how to purchase tickets and to see a full list of exhibitors, please visit the BBC Good Food Show website. For your chance to win a pair of tickets to this show, simply log into the Rafflecopter below and answer the easy question. There are bonus social media entries you can use to boost your chances of being one of the two lucky winners. The giveaway will close at 11.59PM on Friday, 9th November 2018 and is open to UK entrants aged 18+ only. Because the show starts on 29th November, I will pick the winners at 9am on Monday 12th November 2018. They must get in touch to claim their prizes by 9am on Tuesday 13th November 2018. If they have not made contact by that time, new winners will be picked and must claim their prize within 24 hours. The event runs from 29 November – 2 December 2018, at the NEC Birmingham. Only valid on Thursday, Friday or Sunday; no Saturday admission. Prize includes 2 x entry passes – no travel, expenses or accommodation is provided. General admission tickets do not include a seat in the Big Kitchen. Big Kitchen seats are available to purchase on the day for £5, subject to availability. Not all celebrities appear on all days. Contact information will be supplied to third party who will send your winning tickets via email. The prize is for two pairs of general admission tickets, so there will be two winners. Prize cannot be swapped for cash or sold on. What will you be looking forward to seeing at the BBC Good Food Show 2018? I am definitely looking forward to trying (and buying) some new flavours of gin! Hic! My bestie Ali and I love walking around the show tasting and buying new products. A fun day out. Eating and drinking new products and trying new tastes. Looking at all the new products and demonstrations. I always enjoy seeing James Martin and there’s always lots of yummy cheeses to try! I would be looking to buy edible Christmas presents and unusual but useful kitchen gadgets for my friends and family. Fudge with a chilli ingredient was fun last year and appreciated after the first surprise bites! As veteran attendees we love the demos and of course the festive drinks! Trying new products and samples from brands i’ve not heard of before! It’s a great show every year. Looking forward to attending again. Trying lots of different products I haven’t tried before and hopefully seeing the Hairy Bikers :D! All the samples of food and drink! I would so love to go and take my son who loves cooking too. We enjoy cooking together in the kitchen, I’m more traditional but he’s great at adding his own take on a recipe. This would be such a treat for us. Thanks for the chance to win. I am looking forward to trying all the fab food! Im looking forward to seeing all the festive food ideas i love putting on a spread!! Shopping for speciality Christmas presents for all the foodies amongst my family and friends. The shopping, there are stands oozing with different foods, I’m tempted by all the aroma, flavours and colours. Its a massive collection of divine food and its difficult to know where to start!! Looking forward to establishing which is my favourite flavoured Gin! Whats not to look forward to a bit of everything! I,d love to see Mary Berry. I want to find some lovely dipping oils. to see the gbbo peeps! I would love to see a baking session with Mary Berry as I’ve never seen a live session by her before. I love taking my son and we like to see what new products are at the show. I love the alcohol testing section too! Coffee machines and tasting coffee. I will be looking forward to seeing celebrity chefs. I look forward to seeing celebrity chefs. I am mostly looking forward to the cooking demonstrations. I love to get inspiration for new cooking ideas. Trying new food and drink that I haven’t before. I like to see some of the demonstrations and meet the chefs. I like seeing all the celebrity chefs! Lots of new & different spirits. Discovered some great new ones at past shows. I love to discover and try new products at the show, and I love the tasting of the alcohol too, it’s a good just it’s only a short train journey away. This year I’ll be interested in vegan products as despite vegetarian for 30 years we’re now contemplating the vegan route, so I’ll be very interested in trying vegan products. We look forward to the excitement of the day and finding new things. I love all the samples!